International Criminal Court Prosecutor Fatou Bensouda has said that the eight prosecution witnesses unwilling to testify in the trial of Deputy President William Samoei Ruto and former journalist Joshua arap Sang are insider witnesses. This is ICC-speak for witnesses who make allegations that link an accused person to the crimes they are alleged to have committed. Insider witnesses are typically expected to testify about meetings they attended where the accused allegedly participated in the planning of crimes. They may also give details about how the accused was allegedly involved in organizing those who will commit the crimes and about the accused allegedly raising money to fund the commission of those crimes. The witnesses may also be people who participated in committing the crimes. The witnesses in question are known to the public by their pseudonyms only. They are: Witness 15, Witness 16, Witness 323, Witness 336, Witness 397, Witness 495, Witness 516, and Witness 524. In a January 9, 2013 submission to the court, Bensouda said she expected to call a total of 46 witnesses. These eight witnesses pulling out reduced that witness pool to 38. To date 16 witnesses have testified in the trial of Ruto and Sang. Two of them have been expert witnesses, but most of the witnesses have been crime-based witnesses. This is a term used to describe witnesses who narrate to the court what they know about the crimes an accused person is charged with, but they do not make any direct allegations against the accused. 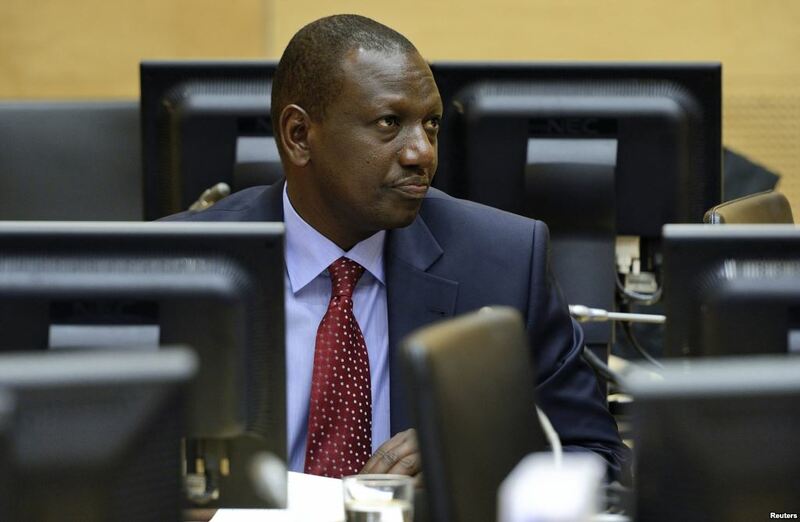 Under ICC rules and at the direction of trial judges, the Office of the Prosecutor was required to reveal the witnessesâ€™ identities months before the trial of Ruto and Sang was to begin. In this particular case, the then Trial Chamber V had directed that the prosecution make all disclosures by January 9, 2013. This was in anticipation of the trial starting in April 2013, before it was eventually postponed to September. The judges did make an exception to the January 9, 2013 deadline. They said the prosecution could apply and be allowed to disclose the identities of witnesses under the ICCâ€™s protection closer to the trial date or when they are expected to testify. Until such full disclosures, the defense would receive redacted statements of those particular witnesses. In the case of seven witnesses, Bensouda stated in a December 5, 2013 application that the prosecution disclosed to the Ruto and Sang legal teams the identities of the witnesses between February and April 2013. (The prosecution filed a supplementary application on February 20, 2014 asking the judges to compel an eighth witness to testify.) Typically, the disclosures to defense lawyers would include the witnessesâ€™ statements and related evidence. In a separate submission, Bensouda notified the trial judges that Witness 15, Witness 16, and Witness 323, may make self-incriminating statements if they testified. Bensouda anticipated in her July 3, 2013 submission that a total of seven witnesses would fall under the self-incrimination provisions of the Rome Statute. To date only one of those witnesses has testified. This is Witness 356 who testified for seven days, starting on January 20. Witness 356 had a lawyer present during his testimony, the first witness to take such a precaution. In the December 5, 2013 application Bensouda gave some details about what Witness 15 and Witness 16 had been expected to tell the court before they stopped cooperating with the Office of the Prosecutor and the courtâ€™s Victims and Witnesses Unit (VWU). The public version of the December 5, 2013 application is redacted, leaving it with information gaps. Witness 15 was going to testify about 11 meetings he claimed Ruto was present at and participated in. He was expected to testify that during those 11 meetings participants allegedly discussed how to get firearms and who would be the field commanders. The participants also discussed finances and logistics, according to the sketch of what Witness 15 was expected to testify on. Witness 15 was also expected to describe what the prosecution has framed as â€œThe Network.â€ This is the group the prosecution alleges Ruto led and was responsible for the attacks that occurred in the North Rift region in January 2008. The witness was going to testify about an attack he claimed he participated in in Yamumbi, which is in the greater Eldoret area, and had been expected to give details about attacks on Turbo and Kiambaa, also in the greater Eldoret area. Witness 15 was also expected to testify how Sangâ€™s show on Kass FM and other programs on the radio station were used to support and incite violence. Witness 16 is the only other witness whose expected testimony has been described in Bensoudaâ€™s December 5, 2013 application. In statements to the prosecution, Witness 16 claimed he was present at two meetings that Ruto participated in. The witness was expected to testify that one meeting took place in public on October 15, 2007 at Kaptabee where the witness alleged that Ruto said Kikuyus should be killed and evicted from the Rift Valley region. Witness 16 was also expected to testify about a meeting he alleged took place at Rutoâ€™s home in Sugoi during which close-to-final preparations allegedly had been made to mobilize and arm Kalenjin youths to evict Kikuyus from the Rift Valley region. Witness 16 was also going to testify about his participation in and provide direct evidence of the attack on Turbo. He had been expected to give evidence against Sang and describe how he used his show on Kass FM to support the violence. Bensouda said in her December 5, 2013 application that both Witness 15 and Witness 16 ceased any contact with the Office of the Prosecutor some time last year. In the case of Witness 15, he recanted three times his previous statements to the prosecution. This was between February and March 2013. Witness 15 recanted his evidence in two affidavits prepared by Paul Gicheru, a lawyer based in Eldoret. In the affidavits he accused the prosecution of bribery and witness coaching. Each time the prosecution received an affidavit from Witness 15, they would contact him, and he would disown the affidavits, claiming he had been forced to sign them. Witness 15 told the prosecution that in one case he had been kidnapped and forced at gunpoint to sign the affidavit. In a January 8 submission, Rutoâ€™s lawyer, Karim Khan, said that this account is completely false. The details of how Khan knows this are redacted. According to Bensouda, Witness 15 had been in the ICC Protection Program until November 2011. The witness remained outside Kenya until he returned on October 26, 2012. In a March 5 joint submission, the lawyers for Ruto and Sang questioned whether it was advisable to compel Witness 15 to testify in his state of mind. â€œIn addition, it is known that P-0015 has emotional and behavioural difficulties. Indeed, he appears to have recanted on at least 3 different occasions,â€ the lawyers wrote. â€œGiven this background, combined with recent developments described in the Request [the December 5, 2013 application], it is submitted that this witnessâ€™ reliability and credibility is irrevocably compromised and he cannot be held out in good faith as a witness of truth,â€ the lawyers for Ruto and Sang wrote. Witness 16 returned to Kenya on July 15, 2013 to renew his Kenyan travel documents and disappeared on July 29 without informing the prosecution, Bensouda said in her December 5, 2013 application. Twice in August the prosecution contacted Witness 16, who each time refused to confirm his continued cooperation with the Office of the Prosecutor. According to Bensouda, Witness 16 never formerly withdrew from the case or recanted his statements to her office. The witness told the prosecution he was remaining in Kenya for the sake of his children and was dissatisfied with the court. Bensouda also stated in her application that Witness 16 was offered five million Kenyan shillings to recant his testimony sometime in July when he returned to Kenya. The details of how Bensouda knew about this bribe offer are redacted. All eight witnesses that the prosecution want to be forced to testify before Trial Chamber V(a) were either in the ICC Protection Program managed by the VWU or the Office of the Prosecutorâ€™s own protection program. All of them told the Office of the Prosecutor that they would no longer be testifying between March and August last year, just before the trial of Ruto and Sang began in September. Bensouda in her December 5, 2013 application said this pull-out by the eight witnesses happened after the prosecution revealed the identities of the eight witnesses to defense lawyers, which were made between February and April last year. However, Bensouda did not explicitly or implicitly state that the defense teams of Ruto or Sang were involved in the witnessesâ€™ withdrawals. In response to Bensoudaâ€™s assertions, Rutoâ€™s lead lawyer, Karim Khan, wrote in his January 8 submission that, â€œthe Defence denies any such suggestions,â€ that it is linked to the witness withdrawals.